Advertise with the only dedicated, daily news outlet covering the dynamic and growing Tysons community. Tysons Reporter reaches those who live and work in Tysons, McLean and Vienna. The site is published by the locally-owned company behind ARLnow (Arlington), PoPville (D.C.) and Reston Now (Reston and Herndon). See our media kit here. To get in touch with us, fill out our contact form below, shoot us an email at [email protected] or give us a call at (703) 348-0583. For express service, get the sponsored content process started now by filling out this form. 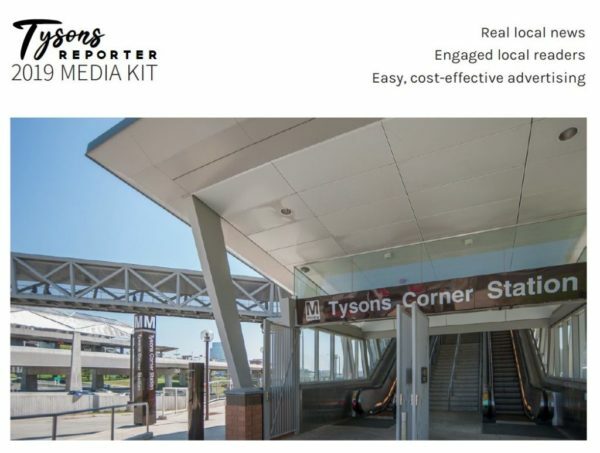 Boasting a highly-engaged audience of 50,000 monthly readers, Tysons Reporter is part of Local News Now, which is nationally-recognized as one of the country’s most successful and innovative online-only local news publishers. Our team believes that great local advertising helps to supplement great local content. Our advertising philosophy in a nutshell: audience, attention, awareness, affinity and actionability. Our advertisers are passionate about enhancing the local community. And they’ve seen real, meaningful results on LNN sites. We’ve sold out events, filled patient schedules and helped home sellers get multiple offers. You can read a recent collection of client case studies here.